“When designing and manufacturing large-format printers, we’d usually use injection molding and machining for parts. At low volumes, these traditional techniques might not be worthwhile. We wanted to reduce the cost while also improving the speed and flexibility of our design process”, says Alejandro Bonillo, HP Production Printing Mechanical Engineer. 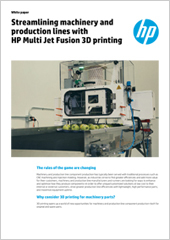 Download the case study to find out how HP used HP Multi Jet Fusion technology in its own 2D printers to help reduce costs and innovate more quickly.